These are 5.5" by 8.5" pamphlets. They are thin enough to print yourself if you have a duplex printer for double sided printing. For example, a 20 page pamphlet takes 5 sheets of paper at 4 pages per sheet. Download the original Word document. To print a pamphlet open the Word doc file, choose print, choose your printer, the click on Properties. Be sure Duplex is selected. Then, depending on what you see, choose the Advanced tab, then click on the icon for booklets. The default is Flip on Left Edge. Change this to Flip on Top Edge. Click OK, choose the number of copies (start with 1 for testing), the click OK to start printing. If all goes well you now have a set of pages for each pamphlet. Next align the pages for one booklet. Then fold the booklet with your hands. Crease the center fold with your fingernail. Finally use a saddle stapler to put two staples in the fold line, about 1" from each end. Then if you have a paper trimmer trim the right edge of each pamphlet. I use the Bidex DC 210 12" Heavy Duty Rotary Trimmer. This is optional but really helps. This is a great, economical way to spread the word on common good concepts. This pamphlet PDF is for reading and this pamphlet DOC is for duplex printing, folding, and stapling. It's designed to be printed on a color printer. The pamphlet introduces the System Improvement Process. This pamphlet PDF is for reading and this pamphlet DOC is for duplex printing, folding, and stapling. It's designed to be printed on a color printer. Read this pamphlet before the one below. They cover the same solution element. 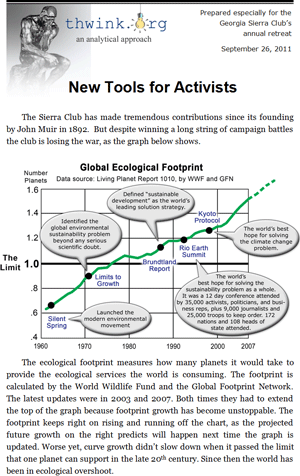 MILLIONS OF DEDICATED ENVIRONMENTALISTS have worked on the sustainability problem for generations. Countless and frequently brilliant solutions have been tried. While some have worked at the local level, and a few have worked at the international level like the stratospheric ozone layer problem, none have worked at the systemic level. Problems like climate change, deforestation, desertification, freshwater shortages, and thousands of types of pollution are growing worse with no solution in sight. 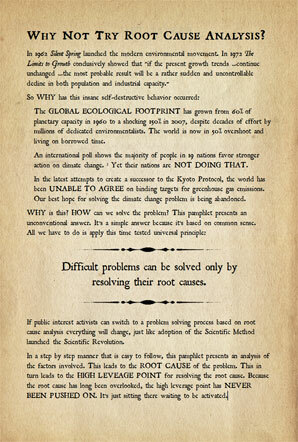 Because popular solutions do not resolve root causes. 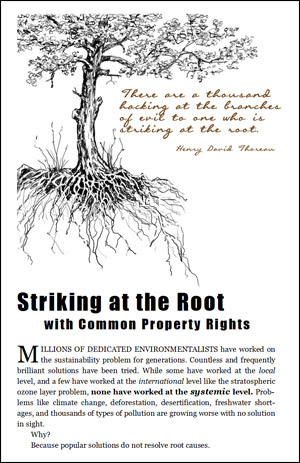 The pamphlet describes a solution element that's ready to implement: Common Property Rights. 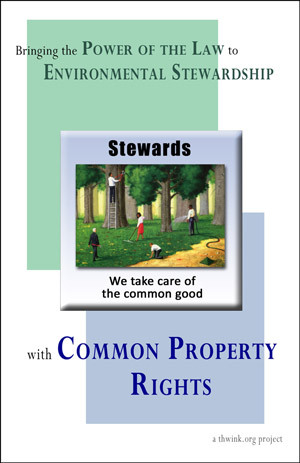 For more information than what's in the pamphlet see The Common Property Rights Project. DESPITE THE EFFORTS OF MILLIONS OF ENVIRONMENTALISTS for over forty years, the sustainability problem is growing worse with no solution in sight. The world’s Ecological Footprint is now at about 50% overshoot with no sign of dropping to a sustainable level in time to avoid collapse. We’re winning a few battles but losing the war. We can try a systemic solution. It’s efficient – It's the mirror image of the world's already existing Private Property Rights system, so it promises to be just as supremely efficient. It’s generic – It applies to all types of environmental problems, just like Private Property Rights applies to all types of private property. 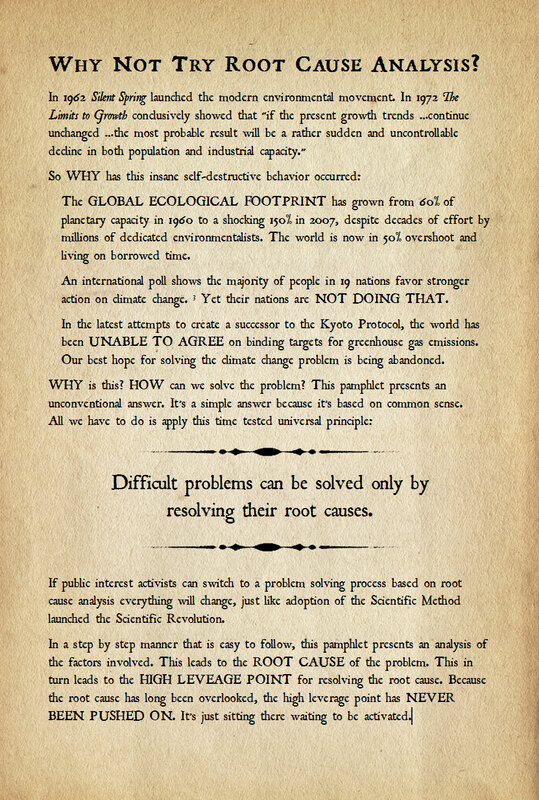 It’s self-replicating – Once the solution is in place it's designed to naturally spread to include and solve all the world's environmental sustainability problems, including those unknown today. Efficient. Generic. Self-replicating. No other solution offers these qualities including pollution taxes, emissions trading, regulations, conservation, cooperative management, and privatization. These three qualities are how we can bring the Power of the Law to environmental stewardship. Even better, the solution is ready to implement. So how would you like to make history and be one of the world’s first legal environmental stewards? This pamphlet PDF is for reading and this pamphlet DOC is for duplex printing, folding, and stapling. Public interest activists are winning a long string of battles but losing the war, all because they are using antiquated tools. This pamphlet introduces the three main tools that are the heart and soul of the Thwink.org paradigm: root cause analysis, process driven problem solving, and model based analysis. "In difficult social problems, change resistance is the crux. It must be solved first because until change resistance is overcome proper coupling is impossible." "This is an important insight that once fully accepted will have deep ramifications. 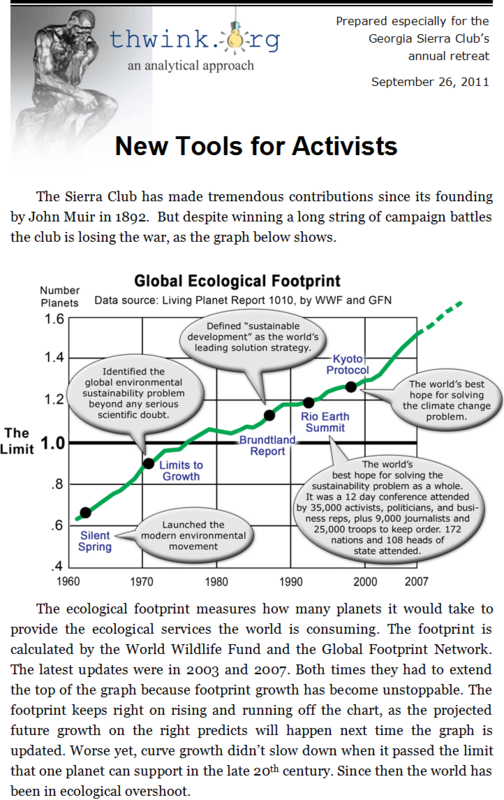 The Sierra Club’s many campaigns will have little effect on the overall sustainability problem until the change resistance subproblem is solved. This implies a refocus of how the club is organized. Currently there is no significant analysis function of the problems the club is working on. That void can be filled the same way business handles its own analysis problem: by creation of a well staffed, well funded, process driven R&D department. The output of R&D becomes the input for the club’s main departments of conservation and communications—just as the output of R&D feeds manufacturing and marketing in the business world." 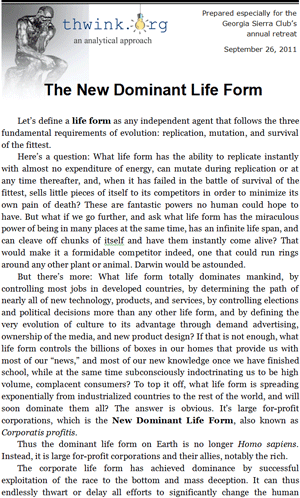 Unbeknowest to most citizens Homo sapiens is no longer the dominant life form on the planet. That role has been taken over by another life form, who is now the New Dominant Life Form. This is the modern large for-profit corporation. Because their goals are fundamentally opposed to those of humans, the system works for their benefit and not ours. This explains why the sustainability problem (as well as many other problems whose solution would benefit the common good instead of large for-profit corporations) has so far been impossible to solve. The highlight of the pamphlet is The Competitive Advantage of Two Life Forms table. 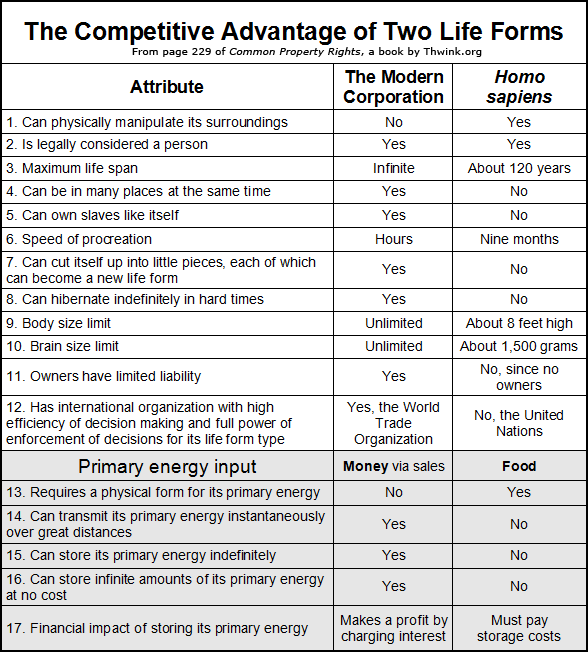 This compares the competitive advantage of The Modern Corporation to Homo sapiens. Poor Homo sapiens. He doesn't stand a chance. Unless, of course, something changes. The pamphlet briefly discusses how this can be done using the Corporation 2.0 solution element. NOTE - This is the pamphlet version of the online article by the same name. The online version is much more readable. We suggest you try that version unless you are considering printing pamphlets. In late 2011 and early 2012 this online article briefly became the most popular article on Thwink.org. Its appearance coincided with the Occupy and Move to Amend movements, since the article was designed to strengthen the long term success of those movements. "I joined Move To Amend and organized the (name of organization) affiliate, thinking I was striking at the root cause of our problem. Now after reading thwink.org, I realize I am not and have begun rethinking my approach by further study of the website." "I knew your arguments were sounding familiar. I looked your site over last week and feel like I could spend a week of intense study on it. I feel like the entire Occupy movement should spend time in it, and we can help that with our (name of organization) Facebook page that we've only just begun. We'll use the video you created and basically push your site as an essential resource." "I caution you about these writings. People will accept only want they are ready to accept. At the moment, people are ready to accept that Citizens United and Corporate Personhood have stolen our democracy. People are ready to accept that Citizens United can be overturned by a constitutional amendment. The Move to Amend movement has caught fire as evidenced by over 300 demonstrations; plus the Sierra Club and other powerful advocacy groups have come on board." "You argue that overturning corporate personhood will not completely solve the problem with which I may agree; however, people are not ready to accept that. Not yet. I urge you to not throw water on this very small flame that is the Move to Amend movement. ... Do not douse the spark of our movement before it if a full ranging fire." What we see here is paradigm change resistance, ironically from those who need this information the most so they can overcome change resistance to the solutions they are proposing. violently opposed. Third, it is accepted as self-evident. These are 6" by 9" pamphlets. They are so thick (due to so many pages) that you can't print them yourself unless you have a really good saddle stapler and can hand fold a thick stack of pages well, or a few sheets at a time. We have high quality copies of these from a printer for sale. The cover is in color. The interior pages are black and white. The pages are heavy duty, making these thick pamphlets like a little book. Please contact us to order copies at $3.00 each plus postage. This pamphlet PDF is for reading and this pamphlet DOC is for duplex printing, folding, and stapling. 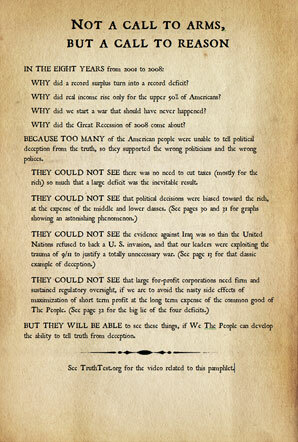 This pamphlet is available in printed form for $3.00 each plus postage. If you're using the DOC file you will need this free font: Roman Antique. 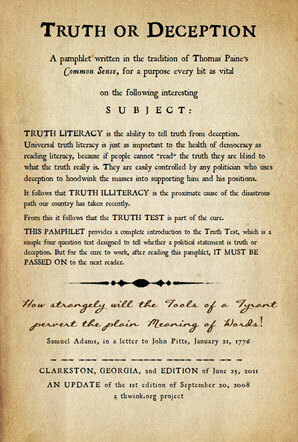 The pamphlet is introduced in The Truth or Deception Video. Here are the first nine pages. 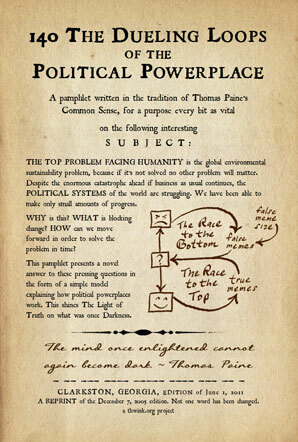 The pamphlet is written the style of Thomas Paine's pamphlet Common Sense. It has the same number of pages: 46, plus the front and back cover. It's written for a purpose just as vital: how a nation can throw off the bonds of oppression. Common Sense did it by telling the colonies the truth about what England was doing to them and their probable future if that relationship continued. 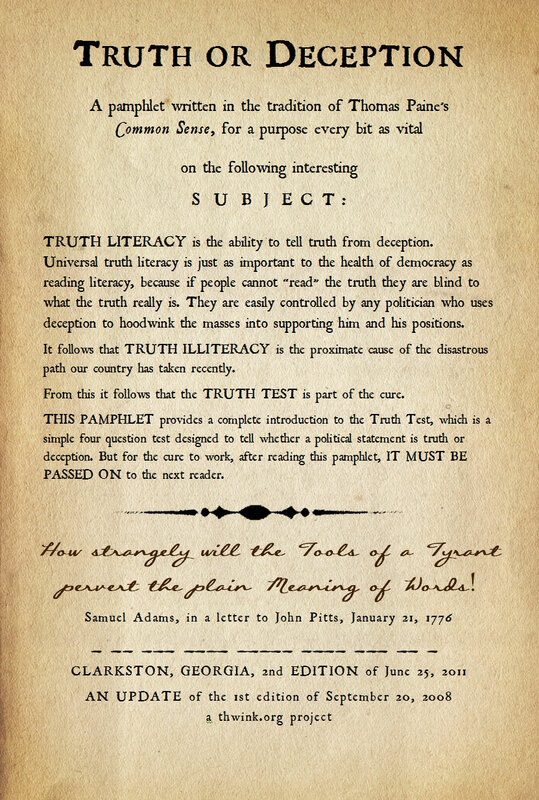 Truth or Deception does it by providing citizens with a simple tool to tell truth from deception: the Truth Test. The truth, once seen with your own eyes, is that in America and many other nations the population is being deceived and oppressed by the New Dominant Life Form. This is a reprint of the most popular document on Thwink.org: the unpublished Dueling Loops paper of 2005. Front and back covers have been added to more completely describe the paper's context. It's essentially an answer to the question "Why not try root cause analysis?" 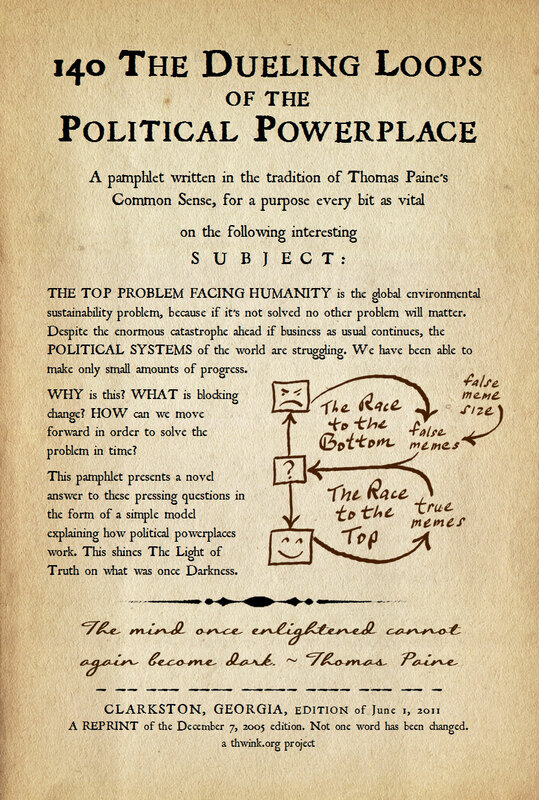 as explained on the back cover. 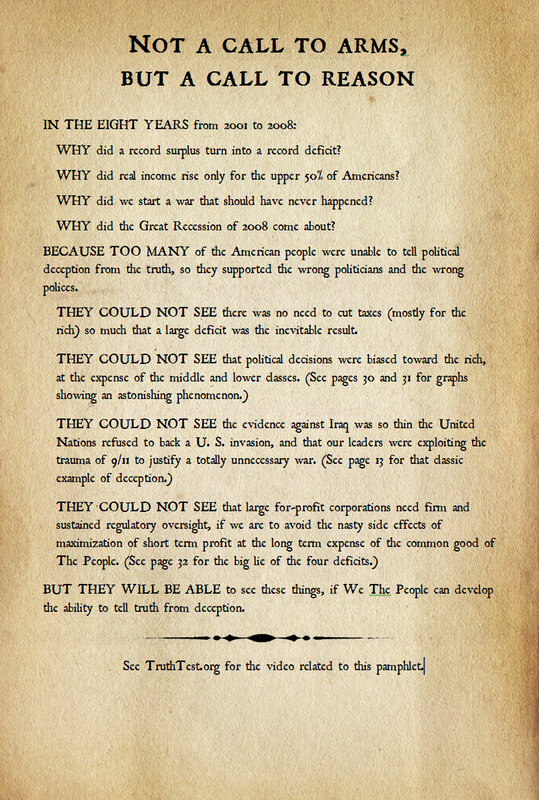 Click on the back cover to read a large copy of the image.